When I first made this bread I wasn’t expecting it to wow me, but I was wrong and it has become a popular snack in my house. 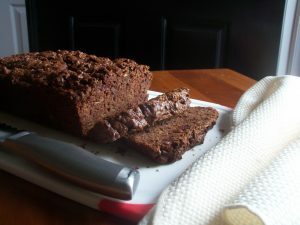 A rich moist chocolate bread with a tender crumb. If you have never made a zucchini bread and are concerned with tasting a vegetable in your desert, don’t worry, you can’t even tell that it’s in there. In this bread you have chocolate from the cocoa powder and the chocolate chips and sweetness from maple syrup, yum. This can easily be a gluten-free snack by using a gluten-free flour. Enjoy! Preheat oven to 350 degrees and grease a 9×5 loaf pan. 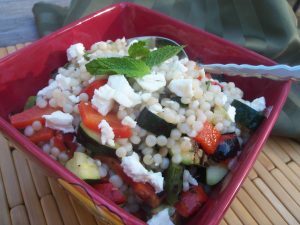 Place grated zucchini in a colander, allow to sit for 5 minutes and squeeze excess water out. In a small saucepan on medium heat or by microwave, melt coconut oil and maple syrup together until combined. In a small bowl, whisk the eggs together until combined, pour into the maple syrup mixture and vanilla and stir well. Add this mixture to the drained zucchini and set aside. Pour mixture into greased loaf pan and smooth out top. Bake in the oven for 50-60 minutes or until a toothpick comes out clean from the center. Remove from the oven and allow to cool for about 10 minutes before taking out to rest on a wire rack to cool completely. Store in an airtight container or wrap with foil and freeze for later To thaw, simply put in the fridge or set out on the counter top. No matter what flavor of chicken wing you enjoy, or the level of heat, this seasoning is a good “foundation” to start with. I am one that has a problem with cooking meat and not seasoning it. The end result of your dish is much more flavorful and delicious when seasoned properly. This recipe makes enough for about 3 pounds of wings, so if you do not plan on cooking that many, it keeps great in an airtight container. Feel free to use on any other meat protein you’d like. Enjoy! 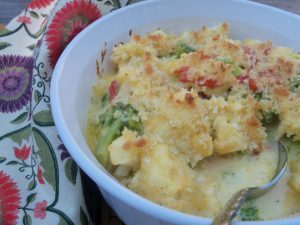 This easy side dish of cauliflower, broccoli and a delicious cheese sauce can also become a main dish by adding either cooked chicken or ham. Pimientos and Dijon mustard are added to a traditional cheese sauce, and panko bread crumbs tossed in butter are sprinkled on top of the casserole. Since this is a large side dish, I simply cut it in half for my husband and I. Enjoy! Preheat oven to 375 degrees. Lightly spray and 11×7 inch baking dish with cooking spray. In a large Dutch oven, bring cauliflower and broccoli to boil over high heat. Reduce heat, and simmer until crisp-tender, about 3 minutes. Drain well. In Dutch oven, melt butter over medium heat. Whisk in flour; cook for 2 minutes. Gradually whisk in milk; cook, whisking occasionally, until thickened and bubbly. Stir in pimientos, salt, and mustard. Stir in cheese until melted. Stir in broccoli and cauliflower, and pour into prepared pan. In a small bowl, stir together bread crumbs and melted butter. Sprinkle onto casserole. Bake until golden brown and bubbly, 20 to 25 minutes. Let stand for 10 minutes before serving. 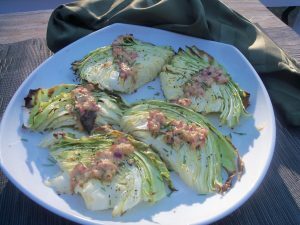 Roasted cabbage slices drizzled with an onion-Dijon sauce are quick, simple and delicious. If you’ve never roasted cabbage this could be a game changer for you. Roasting vegetables brings a different taste and texture to them with caramelization and crispy edges. Add a complimentary sauce of butter, onion, Dijon and garlic and you have a delicious dish to serve to your family. Enjoy! Heat oven to 450 degrees. Line a baking sheet with parchment or silicone or spray with cooking spray. Cut cabbage half into 1-inch slices and set on prepared baking sheet. Use a pastry brush to coat the cut side of each slice with oil and sprinkle with salt and pepper. Turn slices and repeat. Place the baking sheet in the oven and cook for 10-12 minutes. Flip the wedges and roast until nicely browned, 6-8 minutes more. Meanwhile, make the sauce by adding all the sauce ingredients to a small saucepan and cook over medium heat until the butter is completely melted. Keep warm. To serve, place the wedges on a plate and drizzle with the sauce. Sprinkle with chives or parsley, if desired. 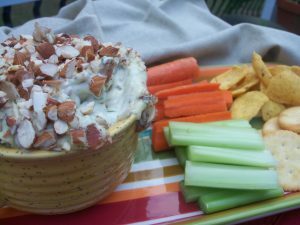 This warm blue cheese dip will be one of your favorite appetizer recipes for entertaining. I can not tell you how insane it is! It is one of those appetizers that you just can’t walk away from. My husband who does not care for blue cheese even liked it. This is a great appetizer that you can put together ahead of time and then toss in the oven a half hour before your guest arrive. 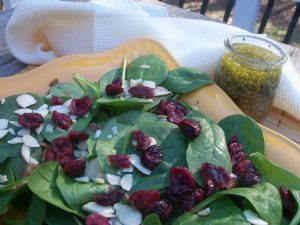 Serve with tortilla chips, bread, crackers or cut-up veggies. You can bake it in several small ramekins or a 1-quart dish. Enjoy! Heat oven to 350 degrees. Cook chopped bacon in skillet until crisp. Drain bacon on paper towel and drain oil from skillet, leaving a thin layer of bacon fat in the pan to cook the garlic in. Return bacon to the pan and add garlic; cook until garlic is tender–be careful not to burn it. Drain the garlic and bacon on paper towels. Beat the softened cream cheese in a bowl until smooth. Add heavy cream, blue cheese and chives and beat well. Fold in the bacon-garlic mixture. In a baking dish, spread the mixture and sprinkle with almonds. Bake in the preheated oven 25-30 minutes, or until dip is melted and bubbly. Serve warm. Miso is a new ingredient for me to cook with. I watched Tiffani Thiessen on the cooking channel use it in this salmon dish and thought I’d give it a try. I had to do a little research since I had no clue as to what I was looking for. I did have difficulty finding it at first but found it at Whole Foods. Miso Master Organics is the brand I purchased. Miso is made from fermented soybeans and is a thick-like substance. The most common use is for Miso soup, but it adds a unique burst of flavor to salad dressings, sauces and marinades, and vegetable dishes. In this dish, salmon is glazed with a sauce of honey, lime juice, miso, soy sauce and garlic then grilled till flaky. I found this only took around 5 or so minutes for mine so make sure to keep an eye on them. Enjoy! Preheat a grill to 350 degrees over medium-low heat. Combine the honey, lime juice, miso, soy sauce and garlic in a small bowl and blend well. Place the salmon on the cedar plank and brush with the sauce to coat. Set the plank on the grill, over and cook until the salmon just flakes with a fork, 20 to 25 minutes. Toss the scallions in the oil and season with salt and pepper. 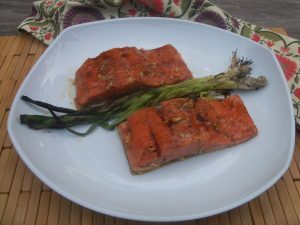 When the salmon has about 5 more minutes to cook, add the scallions to the grill and cook them until charred and softened, Remove the salmon from grill, brush with more sauce and let sit for 5 to 10 minutes. Serve with the charred scallions. 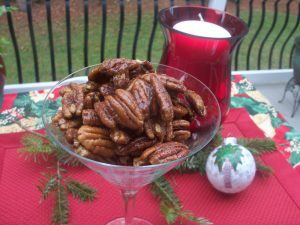 Although delicious anytime of year, spiced nuts are a great addition to your holiday entertaining and make a great hostess gift. There are many arrangements of spices you can use, increase or decrease any of them to suit your taste. Enjoy! Preheat oven to 250 degrees. Line a baking sheet with parchment paper or spray with cooking spray. Combine the sugar and spices. Set aside. In a bowl, beat egg white until frothy. Slowly whisk in the spices. Toss egg mixture with pecans. Spread on prepared baking sheet in a single layer. Bake for 35 to 40 minutes, gently stirring every 15 minutes or until the meringue is golden. Allow nuts to cool and dry out. If you make no other desert for the holidays, this is it! I shared this with my neighbors and friends and everyone raved about it. What they had left over they ate for breakfast the next day! 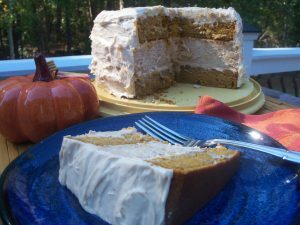 Two layers of moist pumpkin cake have a layer of spiced cheesecake in between them, with a cinnamon cream cheese frosting topping it all. Cinnamon, nutmeg and clove provide the season’s flavors both in the pumpkin cake and the spiced cheesecake. A tip I found helpful was to make the cheesecake a day ahead of the pumpkin cake since it takes a lot longer to cool. Enjoy! Preheat oven to 300 degrees. Line the entire inside of a 9 inch cake pan with aluminum foil. Press it into the pan to get it as flat as you can. You’ll use the aluminum foil to lift the cheesecake out of the pan when it’s baked and cooled. In a large mixer bowl, mix the cream cheese, sugar and flour together until combined. Use low-speed to keep less air from getting into the batter, which can cause cracks. Scrape down the sides of the bowl. Add the sour cream, vanilla extract and spices and mix on low-speed until well combined. Add the eggs one at a time, mixing slowly and scraping the sides of the bowl after each addition. Pour the cheesecake batter into the lined cake pan. Place the cake pan inside another larger pan. Fill the outside pan with enough warm water to go about halfway up the sides of the cake pan. Bake for 1 hour. Turn off the oven and leave the cheesecake in the oven with the door closed for 30 minutes. Do not open the door or you’ll release the heat. Crack oven door and leave the cheesecake in the oven for another 30 minutes. This cooling process helps the cheesecake to cool slowly to prevent cracks. Remove cheesecake from oven and chill until firm, 5-6 hours. Preheat the oven to 350 degrees. Line the bottom of two 9 inch cake pans with parchment paper and grease the sides. In a large mixing bowl, cream the butter and sugar on medium speed until light in color and fluffy, 3-4 minutes. Add the vanilla extract and oil and mix until combined. Add eggs and egg white in two batches, mixing until incorporated after each addition. Scrape down the sides of the bowl as needed to make sure everything is combined. Add the dry ingredients to a medium-sized bowl and whisk to combine. Add half of the flour mixture to the batter and mix until combined. Add the pumpkin puree to the batter and mix until combined. Add the remaining flour mixture and mix until well combined and smooth. Scrape down the sides of the bowl as needed to ensure everything is well combined. The batter will be thick. Divide the batter evenly between the prepared cake pans. Bake for 23-26 minutes, or until a toothpick inserted in the middle comes our with a few crumbs. Remove cakes from the oven and allow to cool for 3-4 minutes, then remove from pans to a cooling rack to finish cooling. Combine the cream cheese and butter in a large mixer bowl and mix until smooth. Add about half of the powdered sugar and mix until smooth. Add the vanilla extract and cinnamon and mix until smooth. Add the remaining powdered sugar and mix until smooth. Use a large serrated knife to remove the domes from the top of the two pumpkin cakes. Place the first layer of cake on a cake plate. Spread about 1 cup of frosting evenly on top of the cake layer. Use the aluminum foil to lift the cheesecake out of the cake pan, remove the foil and place the cheesecake on top of the cake. Spread another cup of frosting evenly on top of the cheesecake, then add the second layer of cake on top. Frost the outside of the cake. Refrigerate cake until ready to serve. Cake is best for 3-4 days when frosted and in an airtight container.